“I was completely blown away by the participants and their presentations on Sunday,” Jain said, adding that one team, AdPear, created a mobile phone app and had participants test it on their own phones during Sunday’s pitch session. Along with AdPear, which pairs ads to increase interest and purchases, the final businesses included a software application to improve athletes’ training; an application to turn three iPhones into a three-camera TV studio for multi-angle videos; a gaming platform that allows game developers to personalize products; a crowd-sourced mobile jukebox; and a system to provide customer information to businesses at the start of a cell phone call. The next step for these businesses? Most, Jain said, are working to solidify teams, build prototypes and determine the best way to move their project forward. 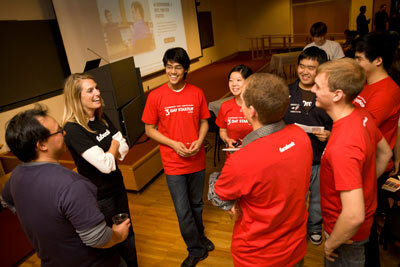 via Cornell Chronicle: 3 Day Startup generates six startup ideas.